EA @ E3 2018... Why God, Why? Home Opinion EA @ E3 2018… Why God, Why? EA @ E3 2018… Why God, Why? It's definitely going to be a good show ...right? Electronic Arts at E3. Nothing drains the E3 hype from me than watching an hour and a half show where EA suits show us their yearly FIFA, Madden and NHL games and try to persuade us that this years game is head and shoulders above the 2018 edition because there’s new grass tech or some nonsense like that. Something about this lads face just annoys me…anyone else? And having closed Visceral Games which was working on a highly anticipated single player Star Wars Game, as well as having no Battlefront to keep us enticed until the end of their show. They also don’t have anything close to a line-up of games that warrants its own show. I miss the days when it was Sony and Microsoft going head to head without the distraction of an EA show. But enough with the EA negativity. There’s plenty of time left for that. So what besides the obvious sports games will we be seeing at EA’s conference? After the s***show that was Mass Effect Andromeda, EA and Bioware need to try and regain gamers trust with their new IP, Anthem. It was one of the games from last year that made people sit up and take notice. The reveal focused heavily on the multiplayer experience and we all know that EA seems to only be interested in squeezing every last dime from its player base and what’s the easiest way to do that? Multiplayer with a copious amount of loot boxes. Anthem’s previous lead designer, Corey Gaspur, who passed away last year had gone on record saying there will be a single-player experience but I have a horrible feeling that it’ll be a half-assed one like their battlefront series. Let’s hope they’ve fixed the facial animation problems that plagued Mass Effect: Andromeda. Don’t forget that Anthem has been delayed into 2019 so expect a pretty thorough demo. The new Battlefield will be shown. 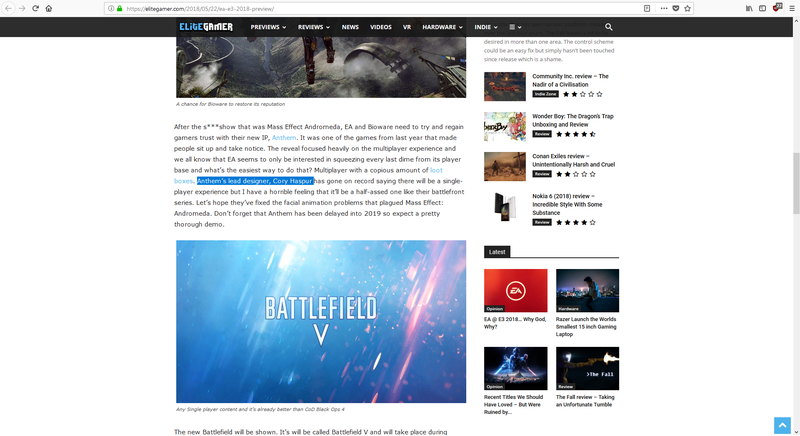 It’s will be called Battlefield V and will take place during WWII. And after the Call of Duty Black Ops 4 reveal confirmed that their will be NO single player campaign, all EA needs to do is show some single player footage and they will already be ahead of CoD. I’d love if this Battlefield focused on the Pacific campaign. One of my favourite WWII games is Medal of Honor Rising Sun which focuses on the fight against the Japanese. In my opinion, the Pacific theatre is often overlooked so it would be refreshing to see it brought to life on PS4 and Xbox One. Especially after CoD WWII covered a lot of the major battles that happened on the continent. The official reveal for Battlefield V will take place on May 23rd at 1 PM PT, which is 9 PM Irish time. There will obviously be FIFA 19, NHL 19, Madden 19 and NBA Live 19. That’s not really a surprise. There’s no need to even show these games because they will sell millions of copies regardless. The people who buy Fifa yearly aren’t the type of gamers who watch E3. I’m sure EA will splash the cash in order to get some famous Football personality. Previously they’ve had Jose Mourinho and Pele participate in what can only be described as one of the most boring and at the same time cringiest interviews I’ve ever seen. They don’t even show gameplay of FIFA/Madden, it’s mostly just CG trailer nonsense. Could EA surprise us with a delightful indie game like they did with Unravel? It’s possible, but will it be enough to leave a positive feeling post show? Unlikely. It’s EA after all. Next articleDungeon Rushers review – Dungeon Rushed? I think you’re talking about the late Corey Gaspur who was tragically killed last summer. And please, bother doing at least SOME research before posting something to the thousands that happen to follow you on twitter. Seems like you need an editor. His name is Corey Gaspur not Corey Haspur.